Myth 10: Dogs live in a dominance hierarchy, with the Alpha dog at the top as the absolute leader. One of the things we hear most about dogs is that dominance is extremely important in organising their groups. The story goes that their interactions are all about gaining and maintaining status. The dog with the higher rank dominates the dog with the lower rank, who submits. Dogs are always trying to climb up the ladder, because they know higher ranks bring bigger advantages in life. This whole story is, yet again, based on tales about how wolves organise their packs. This is the one myth about dogs that virtually everyone seems to know — not only beginning dog owners, but even people who have never had a dog and wouldn’t want one. I rarely meet people who don’t believe in this myth. Therefore, it will probably surprise you to hear that we now know (thanks to Dr L. David Mech) that even wolves do not live in a dominance hierarchy. To live in a dominance hierarchy, and to base your behaviour towards others on who has which rank, you have to be able to do quite a bit of abstract thinking. You’d have to have a map of the social structure in your head, in which you are comparing various ranks with each other and assigning these ranks to yourself and others. Neither the wolf nor the dog has the large frontal lobes in the brain that would enable them to think in such abstract terms. A dominance hierarchy also requires a stable group that is organised in a rigid structure. Dogs do not live in stable groups. They live semi-solitary lives, which are enriched by fleeting friendships. As we will see in Myth 11, the groups dogs do form are not at all rigidly organised. The structure of dog groups is, rather, highly flexible, which is the whole reason they are so good at absorbing infinite numbers of strangers. And the final strange thing about this myth is that no one has ever yet been able to find a real dominance hierarchy within a group of dogs, no matter how hard they looked or what kind of statistics they applied. The whole idea is utter nonsense. So what is going on? How could science make such a blunder, and how did this myth end up being so firmly rooted in our minds? If we want to understand this, we have to go back a little further in history and look at ourselves. It is common knowledge among historians that humans have always projected the structure of their own societies onto the animal kingdom. The ancient Egyptians, for example, lived in a society governed by a royal family, whose members were demigods. Divinity, and links to divinity, were very important in organising Egyptian society. Many Egyptian gods were portrayed as animals, and this was projected back onto the animals in the mundane world, assigning various divine characteristics to various animals. In the Middle Ages, when our societies were organised into nobility versus impoverished, vulgar peons, people also divided the animal kingdom into noble versus common animals. The noble animals were believed to have the same qualities as human nobility. They were beautiful, graceful, clean, courageous, wise, chaste, loyal, chivalrous, and so on. The common animals were like human commoners. They were seen as ugly, clumsy, cowardly, cunning, promiscuous, sneaky and so on. The lower animals were ruled by, and they respected, the noble animals. The human nobility had exclusive rights to the owning and hunting of noble animals, while the human peons had to limit themselves to peon animals. This distinction between noble and common animals still exists among hunters to this day, where the hunting of noble animals still enjoys more status than, say, rat-catching. Although we now like to think of ourselves as more rational and less superstitious, the fact is that our projections onto animals did not stop when the modern age arrived. With the rise of industrialism, we reorganised our own societies to operate on the basis of competition rather than birth. We still find it interesting to have a title of nobility, but you aren’t really Someone unless you are capable of competing on the basis of personal prowess and skills for a place on our social ladder. Social status is not based on magic or on accidental parentage, but on our personal ability to dominate in open competition with other human beings. A trust fund does help, of course, but this is only because it gives us a head start and an edge in our competitive enterprises. We are willing to look up to someone like Donald Trump, who began with thirty million and made more of it by competing ruthlessly with his peers; but there is no creature more despised than the trust fund child who devotes his life to spending Daddy’s money and hoping we will be in awe of him merely for having it. In our society, someone must lose in order for someone else to win, and we adore the winner. We believe that he is naturally superior to the loser in some way. How very accidental that, just as we were rearranging our societies according to this model, someone just so happened to discover that the animal kingdom works according to the principle of competition, too! How very accidental that this insight came at the end of the nineteenth century, just in time to reassure us that the rather unpleasant world we were creating was the only possible outcome of natural laws! See, see, even animals are constantly engaged in ruthless competition, in which only the strong and dominant survive. We are now beginning to understand that this was a projection (see Myth 14), but we do still live in a competitive market society, and this makes it difficult for most of us to let go of the old ideas. But, besides the question of whether competition as such is a natural law, there is another problem. Though our market society is, indeed, obsessed with winners and losers, it is not organised in a strict and rigid dominance hierarchy. In fact, the more our societies are based on open competition, the less of a dominance hierarchy we have. We have human rights and civil rights and freedom of speech, and we don’t simply have to do what rich people tell us to do. If Donald Trump shows up at your door, you can tell him to go jump in a lake, and there’s nothing he can do about it. So where did this idea of a strict dominance hierarchy among animals come from? In fact, this particular idea is a much more narrow projection than the general projection of competitive organisation. The dominance hierarchy is an anthropomorphism (the projection of human qualities into a thing or an animal) that has its roots in a very specific time and place in our history. It is also one of the most tragic things for animals that ‘science’ has ever produced, because the idea of a dominance hierarchy is commonly used to justify all kinds of strange and cruel practices towards dogs. It is the justification for seeing rebellion in everything a dog does, and for cruelly crushing that rebellion. It’s okay to beat him, kick him, shock him, strangle him, because all of this will teach him his rank. Then once he knows his rank, he will automatically obey and do everything we want him to do. The cruelty this idea has generated will no longer surprise you once you have absorbed the following: the idea of a strict dominance hierarchy among dogs was introduced into science by a Nazi (yes, you read that right, a Nazi): Konrad Lorenz. Most people don’t know that the entire science of animal psychology got its start in Hitler’s Germany. This happened in Berlin on 10th January, 1936, when the German Society for Animal Psychology was founded under the auspices of, and sponsorship by, the Nazi government. Konrad Lorenz was co-editor and an important contributor, writing many articles for the Society’s journal, Zeitschrift für Tierpsychologie. Unlike some others who stood at the roots of animal psychology as a science, Lorenz never had problems with the Nazi authorities. On the contrary, he joined the party as soon as he could (1938), and the Nazis liked him so much that he was appointed professor of psychology at the University of Königsberg in 1940. The admiration was mutual. Lorenz worked at the Race Policy Bureau. In 1942, he participated in examining 877 people of mixed Polish–German descent, selecting who would and who wouldn’t go to a concentration camp to be murdered. He believed firmly in superior and inferior races and consistently expressed great contempt for the latter. He believed in a strict, hierarchical society, in which an absolute authority ruled to whom all owed obedience. And, just as humans had always done before them, the Nazis — including Lorenz — projected their ideas about human society onto the animal kingdom. This is illustrated by the Nazi Cult of the Wolf. It just so happens that the Cult of the Wolf played a very important part in Nazi ideology. The wolf was held up as an example, to show that the Nazis were merely trying to reorganise society according to noble, natural laws. Projecting, and without bothering to read any science or to gain any real knowledge, the Nazis (and Lorenz) depicted the wolf as a noble, wild, hardened, ruthless animal who possessed all kinds of wonderful Nazi characteristics. The wolf lived, just like the Nazi, in a closed and elite group. He was, just like the Nazi, absolutely loyal to this group, ready to unquestioningly sacrifice his life for the sake of the group if the need arose. The group’s structure was just as hierarchical and rigid as the structure of the Nazi Party. Each wolf had a rank he strictly adhered to, submissive to those above him, ruthless to those beneath him. Most important perhaps, the wolves were led by a sort of Führer: the Alpha Leader. The Alpha Leader was a strong, always male wolf, whom all the other wolves worshipped and obeyed at all times, and who was fiercely desired by all the female wolves (yes, even the Nazis had sexual fantasies). 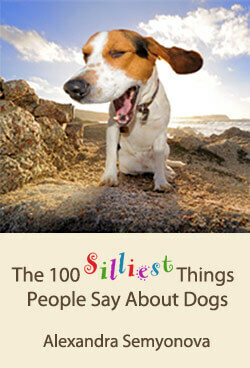 And now come all the other things we are told about dogs. The Alpha Wolf receives deference in all things. He is always the first to eat and the first to go through a door. He is always up front in any kind of procession, and he always gets to sit or lie higher than the other wolves. The other wolves hurry out of his way when he is coming through. They are constantly giving off submissive signals in his presence. The Alpha Wolf can bite anyone he likes without getting bitten back. He is so utterly sure of his authority that he can, when in the mood, behave mercifully towards his inferiors — for which these inferiors are then infinitely grateful and worship him all the more. The similarity to Adolph Hitler can hardly escape us. In general, it is taboo among scientists to personally attack the author of a theory, but this taboo does not (and cannot) apply when the author ignores all evidence to project his purely personal prejudices onto the thing he is studying. Such behaviour leaves us no choice but to address the personal background that led to such prejudices. Lorenz specialised in studying birds. His ideas about wolves had their sole source in the Nazi Cult of the Wolf, not in science. His ideas about dogs were shaped by — as he later put it — the false gods he’d adopted as a young man. He informally observed his own dogs in his living room while he took part in Nazi activities. He first published Man Meets Dog, which was based on these observations, in 1949. There were as yet no published studies of the domestic dog, thus nothing to contradict Lorenz as he daydreamed just four years back to his Nazi Cult of the Wolf. He watched dogs who had been raised only by himself or given to him by his Nazi friends, and who only left the estate he lived on in his company. Lorenz’s dogs were all Chow mixes and Norwegian elkhounds. He in fact had no idea about how dogs other than his own behaved, or how his own would have behaved if they had been properly socialised. But that didn’t matter. Lorenz limited himself to popular publications about dogs — an arena in which everyone is free to present their own opinions as fact. It was an arena that permitted Lorenz to ignore Schenkel, who was at the time the great authority on wolves, and who strongly protested some of Lorenz’s ideas about dominance and submission among them. It was an arena in which Lorenz has been caught in more than one blatant lie, but also an arena where lying has no consequences. Here, Lorenz had total freedom to continue (consciously or unconsciously, it doesn’t matter) spreading the Nazi view of nature — and he used this freedom persistently until the day he died. The idea about dogs living in a dominance hierarchy very like the Nazi Party, and that dogs spend the whole day thinking about power, is nothing more than Konrad Lorenz’s fictional legacy to us. In a sense, Lorenz admits this in his book Man Meets Dog. He writes, ‘In humans, the bonding with ideals only happens once: beware the man who, in an impressionable period of his life, gives his heart to false gods.’ Indeed, after the war, Lorenz adamantly refused to repudiate his Nazi ideas. He was awarded the Nobel Prize in 1973, as co-founder of the ‘science’ of animal psychology. The prize made him powerful in the scientific world, a power he used to suppress contradiction of his theories as long as he lived. Confronted with this, our brave scientists chose to then just ignore Lorenz’s past. (See Myth 99 for explanation of this cover-up.) It was only after his death in 1989 that most of Lorenz’ s theories were finally abandoned as invalid. The main one that still survives is his theory about dogs and dominance, and it’s time to get rid of this one, too. How many of us truly want to treat our dogs as if we’re a Nazi dictator? Fact: The idea of dogs in a dominance hierarchy with an absolute Alpha leader at the top has its origins in Nazi ideology rather than in the real behaviour of dogs. This may be a shocking and rather uncomfortable thing for all of us to acknowledge, but this fiction about dogs has caused so much suffering that it is high time to call it for what it is and to dump it. The quicker we do this, the less shame on us. Carson, G, Men, Beasts and Gods: A History of Cruelty and Kindness to Animals, Charles Scribner, NY, 1972. Cohen, E, Law, Folklore and animal lore, Past and Present 110: 6–37, 1986. Dahles, H, Game killing and killing games: An anthropologist looking at hunting in modern society, Society & Animals, Vol.1, No. 2, 1993. Darnton, R, The Great Cat Massacre and Other Episodes in French Cultural History, Vintage, NY, 1985. Deichmann, U, Biologists under Hitler, Harvard University Press, Cambridge MA, 1996. Hills, AM, The motivational bases of attitudes toward animals, Animals & Society, Volume 1, Number 2, 1993. Konecki, KT, Pets of Konrad Lorenz. Theorizing in the social world of pet owners, Qualitative Sociology Review, Volume III, Issue 1, April 2007 (www.qualitativesoliologyreview.org, accessed July 2008. Lorenz, K, Mens en hond (So kam der Mensch auf dem Hund), Uitgeverij Ploegsma, Amsterdam,  1957. In English: Man meets Dog, Routledge, London, New York,  2002. Mech, LD, Alpha status, dominance, and division of labor in wolf packs. Canadian Journal of Zoology 77:1196–1203. Jamestown, ND: Northern Prairie Wildlife Research Center Home Page. http://www. npwrc.usgs.gov/resource/2000/alstat/alstat.htm (version 16 May 2000). Sax, B, What is a ‘Jewish dog?’ Konrad Lorenz and the cult of wildness, Society & Animals, Volume 5, Number 1, 1997. Worster, D, Nature’s Economy: A History of Ecological Ideas, Cambridge University Press, NY, 1995.